I’ve decluttered soooo many times. Wardrobe, craft, toys, all that stuff in our spare room. And yet I’m still surrounded by crap. I declutter every time we move house, and for about a year afterwards as I unpack everything. And we’ve moved four times in the last five years. So how come I still have mountains of crap that I don’t like?? People give me stuff, and I don’t want to say no. I buy new stuff and don’t get rid of the old stuff I’m replacing. So do teenagers (I live with two). Plus I’m living in my mum’s house, and when she moved interstate, she left a lot of her stuff behind. My husband isn’t very good at throwing things away. No, you really don’t need *four* spare computer mouses in case your current one breaks. And you haven’t played tennis in 10 years so can we please throw away your rackets. And we just have more than we need. We don’t need 20 tea cups. Or two full sets of dinnerware. There are many books out there on the subject of decluttering; I used to read the ones my mum read. Now, the KonMarie method is all the rage: decluttering by asking, “does this spark joy?”, a method I don’t really like because she’s frankly very annoying and condescending in her book and acts like she’s the first and only person to ever figure out how to tidy up (she isn’t) and only very rich people can afford to get rid of stuff that doesn’t “spark joy” because if I did that I would have no house and possibly no children (haha just kidding. Or am I?) and I can’t just skip off and buy stuff that does spark joy on a whim. Then there’s Allie Casazza, who runs a website about decluttering for mums. She purged her house after getting frustrated at the fact that she spent all day cleaning up and didn’t have much of a life as a SAHM. I much prefer her mentality, although most of what I clean up is food/water/body fluids off the floor and no amount of purging can fix that. Also dried-out baby wipes, wet nappies the older boys left on the floor, empty Tiny Teddy packets, muesli bar wrappers, and apple cores. The baby usually takes all of these and spreads muesli crumbs on the cushions, smushes the tiny teddies with drool and wipes beige handprints on the couch – thank god we bought a leather – and gnaws off bits of apple with his tiny sharp little fangs and spits it out periodically, like a cowboy, using the floorboards and my shoes as a spittoon. Seriously I found a soggy crust of bread in my boots the other day. Some of that is laziness on my part – should sit the kids down at the kitchen table to eat 45,000 times a day when they’re snacking, instead of letting them eat in the living room. Some of it is just life with small children. And toys. I clean up their toys a lot, leave out a few boxes, and put the rest away. At the moment I’m just leaving them Duplo and a few trucks. 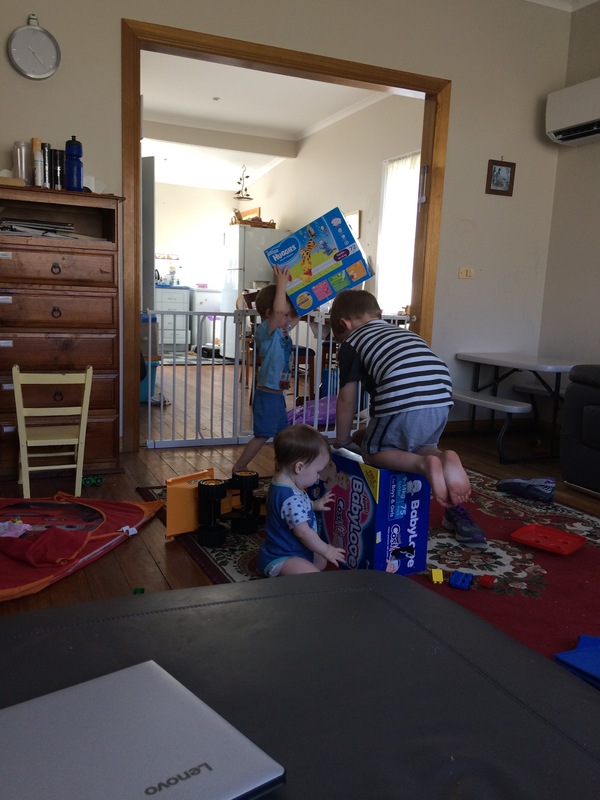 First thing in the morning, they tip the entire box of Duplo on the floor. By afternoon it’s spread through all corners of the house, and 80% has ended up underneath the couch. The rest is positioned for me to step on, or send skittering across the hallway floor as I make my way to the bathroom for a midnight wee. Where was I? Decluttering. Yes. Cleaning. Organising. 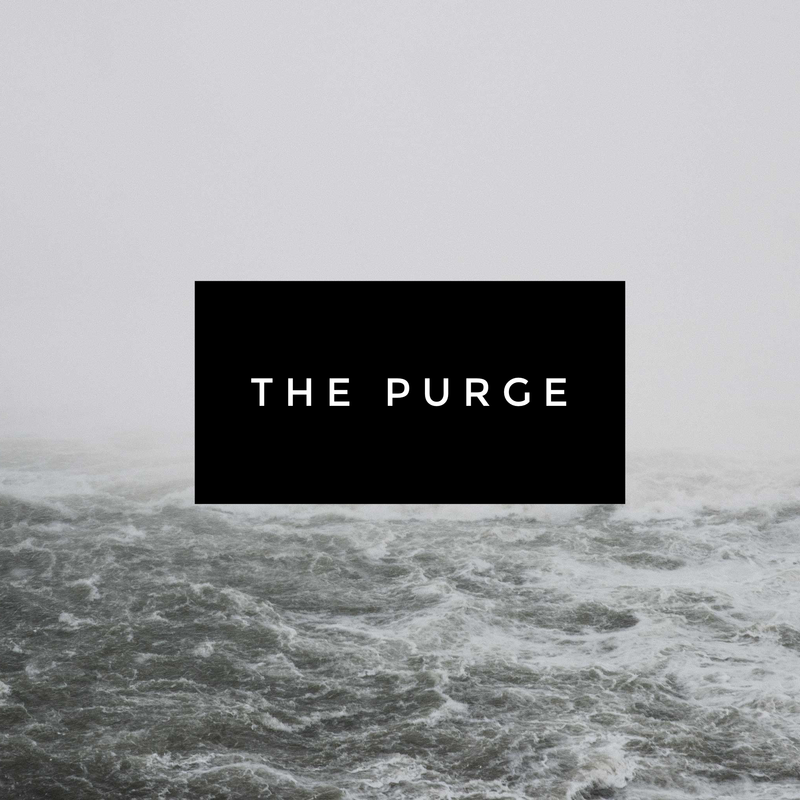 Purging. Being all minimal and zen and never having clutter around. 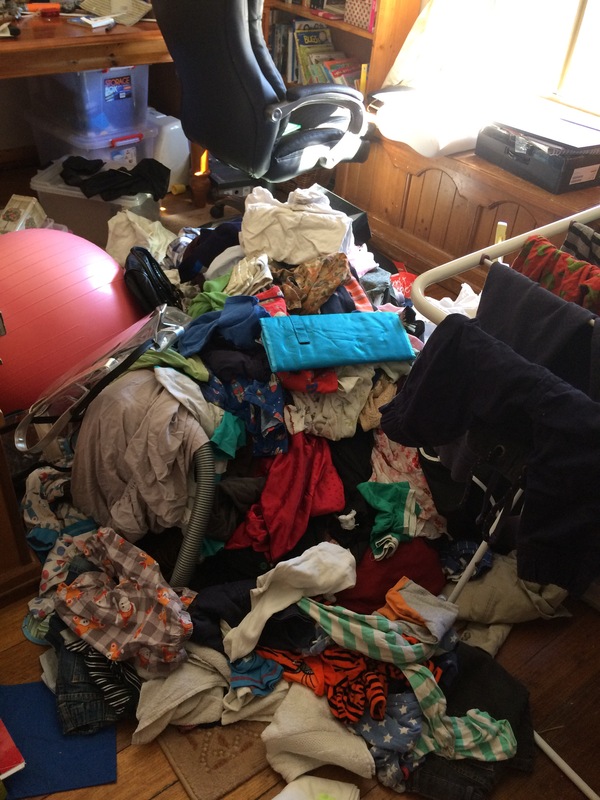 That is the literal mountain of stuff on our spare room floor after I cleaned out the linen closet, craft cupboard, my wardrobe, sewing and fabric stash, shoes, kids clothes, baby clothes, cot sheets, baby blankets, and crap stored under our bed. How can we have this much stuff. Where did it come from, and how come I didn’t throw it away last time I decluttered? So my goal is obviously to have no crap in the house. And to do that, I have to sort through everything. But I also have to: say no when people offer me stuff (especially certain relatives who are hoarders and declutter by giving stuff to me). Tell relatives not to buy toys for my kids at Christmas and birthdays. Buy less. And stop holding onto things that people give me. If they want it they can take it themselves thank you very much. I have to remind my husband that he still hasn’t used 90% of his stuff since the last time I decluttered. I won’t nag, because it’s his stuff, after all. But I’d like a *bit* of it gone. At least one of his spare keyboards or half his 20 bottle openers (people really don’t know what to buy men do they). Craft stuff. This is a big one. *Hobby* stuff. Writing notebooks, photos, scrapbook stuff, stationary (who writes letters any more? ), cute greeting cards people gave me when Darcy was born, only one or two for my subsequent children bc people only care about your first child, after that it’s like meh they don’t need cards or quilts or chocolates, she has three kids now, why would she need people to visit and help out with the baby? Pfft. (Note to self: make “letting go of bitterness towards other people’s reactions to my childbearing” a goal for 2017). I should have probably written a nice tidy bullet-point list of the things I’m going to declutter, maybe with a printable checklist so you can join in the fun! But frankly I don’t care that much, people can write their own to-do lists, because we all have different priorities and different amounts of time to devote to cleaning our homes and the important thing is to get in and do it, not faff around swearing at your printer for 43 minutes. I wish you luck in your purging endeavours. Thanks for reading, and if you don’t hear from me soon, I’m in the corner rocking back and forth and crying because we’ve run out of garbage bags.